STOCKHOLM – Epiroc AB has been awarded a significant order from Anglo American for its new copper mine in Peru. A BenchREMOTE station like the ones going to the Quellaveco copper mine. The miner has ordered multiple drill rigs and related equipment to be used at its new Quellaveco open pit copper mine in Moquegua. The machines will help ensure that the mine, which is currently in development, operates with optimal safety, productivity and efficiency. The order totals about C$55.5 million. Most of the contracted order value was booked in the fourth quarter 2018 while a smaller portion will be booked in the first quarter 2019. “We are proud to once again team up with Anglo American and play a key role in making sure that its new mine in Peru is operated in the most productive, safe and cost efficient manner possible,” said Helena Hedblom, Epiroc’s senior executive VP mining and infrastructure. 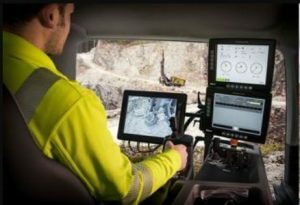 The order includes Pit Viper 351 and SmartROC D65 drill rigs, BenchREMOTE remote operator stations, rock drilling tools and HB 10000 hydraulic breakers. The machines incorporate state-of-the-art technology features. For example, operators can run rigs remotely from a safe distance. Delivery will start in early 2020 and continue through 2021. Quellaveco represents one of the world’s largest copper reserves and the project will employ thousands of people. Actual copper production is expected to begin in 2022. Recognizing that support of local communities is key to the mine’s long term success, Anglo American has consulted with local authorities and institutions and made commitments relating to water management, environmental care and social investment. More information about the Quellaveco mine is found here.